Show your spirit with this American theme box! 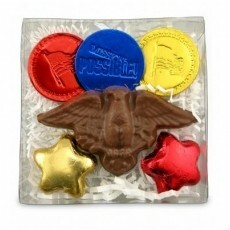 2.72 oz Clear box filled with 3 chocolate coins, 2 chocolate foil wrapped mini stars and 1 chocolate eagle. Choose from our stock coin messages or create your own custom coin for an additional $60 (v) setup charge.